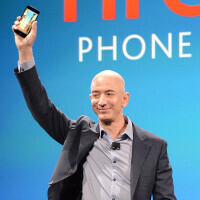 Amazon has just unveiled its first smartphone, dubbed Fire Phone, and guess what - the handset comes with a surprising new feature - 3D user interface! Well, we weren't exactly shocked, since this has been rumored all along, but nonetheless, it's exciting to see someone try to do things a bit more differently in this industry. So, first before most, let's just say that the UI won't constantly tilt left and right. Actually, it'll be more of a limited effect, which will be utilized in a select number of apps, where it has the potential to actually add something to the experience. The Amazon Fire Phone has four cameras mounted on its front side. It needs those cameras because it wants to track the exact positioning of your head relative to the screen at all times. It doesn't use all four sensors at a time. They are four, one for each corner of the device, and the idea is that it needs to "see" you through two cameras as a time, in order to get a precise depth information (Z), in addition to the X and Y coordinates. If you're holding the phone in normal, portrait orientation, it'll use the upper two cameras to get the positioning data. If you're holding it in landscape, it'll then use the two cameras that happen to be in the two upper corners, depending on which side is facing up. That's why there are four sensors. Additionally, there is a small infra-red blaster in each, allowing it to capture the needed data even when you're using the phone in the dark. Now, about the 3D UI effect itself... The Fire Phone's display doesn't try to emulate some form of glasses-free 3D image, similarly to handsets like the HTC EVO 3D and LG Optimus 3D. Instead, it takes into account the positioning of your head and tilts the interface accordingly - this way, it creates a dynamic perspective effect, allowing you to see the items on screen as if they are in 3D - looking differently when viewed from different angles. However, as we said, the effect will be present in a very limited number of apps. The built-in lockscreens, for example, will exhibit a fancy 3D effect... you know, just for the fun of it. Another major app where the 3D tilting will be present is Maps, although it's currently unknown who's going to supply the maps themselves. Tilting things around won't be the only use for the dynamic perspective feature, though. Amazon is also using its intricate camera gear to enable the execution of some special gestures, such as auto-scroll, tilt, swivel, and peek... Obviously, these are various types of gestures that will be usable in different moments and apps, depending on how the particular interface is designed. These actually remind us of Samsung's various "Smart" gestures, such as Smart Scroll, which haven't been truly reliable, but let's hope Amazon's implementation will be better. At the end of the day, the '3D' in the Amazon Fire Phone is nothing like the '3D' that we know from some older phones, which is a good thing. We can certainly see the marketing potential for it, though at this point, we can't really be sure in its usefulness. What do you guys say - is the Fire Phone's dynamic perspective UI effect going to be a piece of useful functionality, or just another gimmick? Sound off in the comments below! sounds like ATT exclusive gimmicky expensive junk. Some sort of gimmick feature that seems to barely work. Pass. Amazon could have put a FHD screen on the phone instead of spending money on this nonsense.